The Apple blossom tree was drenched. Mist curled over the mountains in Lachung and I woke up to the sound of rain splashing on the window of my homestay room. In Lachung, an idyllic hamlet in North Sikkim, this was quite normal. I mistook it to be a passing shower, gearing up to explore Yumthang: the picturesque valley on every mountain lover’s list . I was secretly hoping it IS actually a passing shower , lest I end up with no photographs of a valley that boasts of picture postcard views. There was no sign of the sun as clouds hovered around the neighbouring mountains and rain drops kept hitting the ground. A one hour drive from Lachung, Yumthang valley is famed for it’s burst of Rhododendron blooms in late March and early April. How I earnestly longed to capture the beauty of sun-kissed spring at Yumthang. But the rain gods clearly had other plans. While my heart gave up all hopes of photography in the incessant downpour, as we drove out of Lachung, the scenery came to life. It was damp, moist and wet but the mist added to the drama in the skies and nature began to recite poetry. In front of my eyes was a carpet of lush green fields spread far and wide on terrace farms with wooden houses perched right in the middle. Rocky, grey and jagged mountains overlooked them with swirls of clouds playing hide and seek and the roads leading to them were pebbled with water splashing from the numerous waterfalls nearby. These curved roads were flanked by gigantic rocks are strewn across either side of the road as the car traverses through this surreal terrain. The mist was still closing in, the raindrops had softened and the forest was alive with all shades of green as we drove through it. Poplar trees stood tall in the middle of the rocks, colouring the forest with varied hues of yellow, light green, mustard, dark and fluorescent green. At every turn, nature turned the muse and me the poet, I looked out for words to describe its beauty and it said hold on, watch the next curve. This is when I saw them: Clusters of Rhododendron trees. We were crossing the Shingba Rhododendron sanctuary and it was the flowering season! Yumthang valley literally means a valley of flowers, named rightly so. 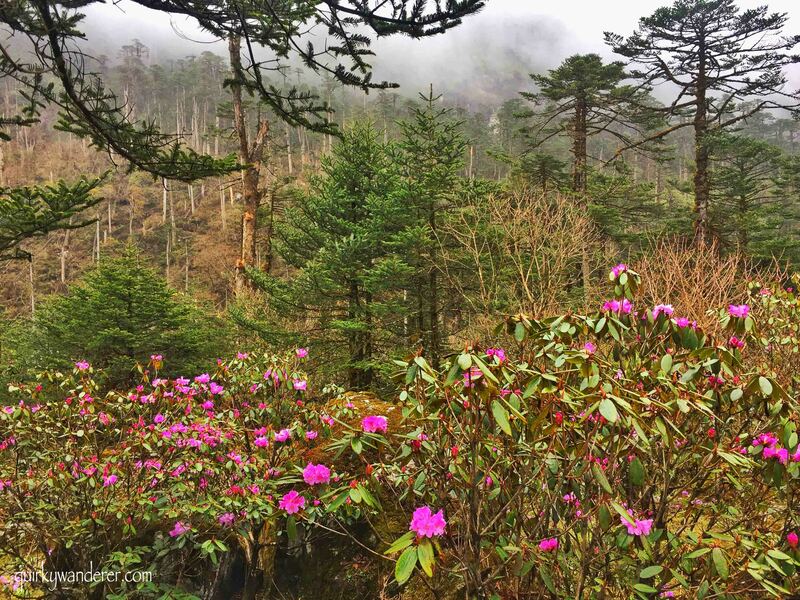 In the grey background of the rugged mountains, rhododendrons splashed colour: endless reds and pinks. At one curve there were white bouquets of flowers perched on grassy meadows, at the other there was a tangled mesh of pomogrenate red rhodos bathed in the fresh rain. The Shingba rhododendron sanctuary is home to over 40 varieties of rhodos ( locally called Etho Metho) of varied colours.On one side, was the mighty Teesta river flowing by cutting through the boulders, on the other was a mystical forest with fallen barks, lichen clad rocks and a dark green velvety carpet. A burst of red ! The scene looked gothic yet a real life representation of a scene from a Russian fairy tale. A tiny lane with souvenir shops selling vibrant woollies and dishing out Momos and Maggi announced the arrival of Yumthang. From here visitors can proceed to Zero point at 16000 feet for frolicking in the snow, or go down the meadows to spend time with the Teesta in the company of Yaks. I chose the latter, descending down to the pristine Teesta, which was raging alongside and this was my chance to touch it and taste it. Yaks grazed aimlessly on the meadows where dewdrops glistened and purple primulas were spread over like a purple carpet. A small walk over the pebbles led me to the waters of the crystal clear Teesta. From here the views called for adjective laced praises: mountains kissed by clouds , overlooking the milky Teesta, flanked by freshly bathed grassy meadows. I bend down to collect a fistful of the icy cold river. As the river swelled over the boulders, my heart did too, with happiness. After an hour long rendezvous with the river, it was time to head back to Lachung, but not before shopping for woollens made by locals. Back to Lachung : for cooking and celebrations. The sun had not peeped out the whole day, and as I made the journey back to Lachung, catching raindrops on my outstretched palm, I did not miss it. It was one of those clumsy rainy days that grow onto you slowly and make you fall in love with raindrops pelting on your face as you walk in the mist. The drive to and fro Yumthang is proof that journeys can be as enchanting and mesmerising as the destination, with rustic wooden cottages scattered in the valley, waterfalls gushing at every bend and flowers springing out of nowhere. Back in Lachung, where there is little to ‘see’ in touristy terms, I decide to call it a day entering a local tavern, where I meet Pema, a local who engages me in a quick cooking session. I learn to make spinach, in the Sikkimese style, as this wonder woman manages her one year old toddler, sells local shawls to customers and also serves Chang, the millet beer to the local men. Folk tunes are sung, laughter rings in the tavern, the atmosphere is akin to a celebration. A celebration of the slow, mellifluous life in the hills, a celebration of the blooming Etho-Metho and a celebration of a damp rainy day that did not dampen spirits. Yumthang is 50 minutes away from Lachung, North Sikkim and 5 hours away from Gangtok. Zero point is ahead of Yumthang by 1.5 hours and requires a special permit plus costs Rs.3000 per car additionally. Foreigners are not permitted to visit Zero point, but they can visit Yumthang. Best time to visit: March-May when the Rhododendrons are flowering at their best and the snow hasn’t melted. Just before reaching Yumthang, there is a small diversion leading to the Yumthang Hot springs where the water is rich with sulphur and known to have medicinal properties. Maybe another name of paradise? It look old exactly like that! Being a Punjabi you should know better how to make Saag? I have read a few post on Yumthang earlier too and I must say it is beautiful. Your pictures affirms its beauty. Someday…..
We Bhutanese also call Rhododendron flowers as Etho Meto and millet drink as Chang. Looking at those wonderful pictures, I felt I was somewhere in highland hamlets of Bhutan. Such a wonderful creation of nature! What an amazing place! The pictures look surreal. The amazing Teesta river, the serene misty valleys with its teeming natural surroundings! What a breath of fresh air it was! Someday, someday….fingers crossed! looks amazing and beautiful place…The pictures look stunning…. Yumthang valley is indeed wonderful. I visited a few years back, both Lachen and Lachung. Enjoyed the trip thoroughly.